The country of Switzerland, acknowledging men's fixation with the World Cup which begins June 9, has launched an ad campaign to lure women to a country "where men spend less time on football, and more time on you." 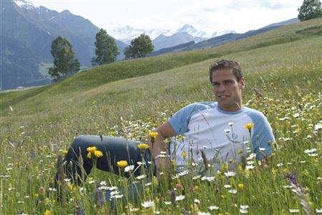 The television spot, airing in France, Germany and Switzerland, features hunky men including Mr' Switzerland 2005 himself. Subway has has signed a deal with USC running back Reggie Bush who is featured in the chain's recent commercial which just launched today. The commercial, which we like very much but aren't really sure why, promotes a...wait for it....yes, a blog called SubwayFreshBuzz. The blog launches April 8 and will feature 2-3 daily posts from Reggie (or someone writing for him but let's hope not) offering us his thoughts as he enters his rookie year. There's also chat, videos and other good stuff about Reggie and, of course, promotion of healthy eating habits via Subway's healthy menu. You can view the ad here.